Electric vehicles have lower running costs than petrol or diesel vehicles, so for businesses where mobility is central, such as taxi drivers or bus companies, rapid EV chargers are the obvious choice. Having EV charging stations at your place of work will become increasingly vital to attract business. Clients and customers may wish to fast charge their car when visiting your business premises. This is likely to be especially true in the retail/hospitality sectors, where being able to provide charging points will attract customers at the expense of those who do not provide this service. Your staff are also likely to require the ability to charge their electric cars at work – so it’s important to consider if you want to keep them happy! There are a range of unique smart features that can be implemented for electric car charging points for businesses, detailed below. Many electric car charge station installations for businesses require multiple chargepoints. If all were being used simultaneously this could require an oversized, over-engineered solution, or otherwise risk overloading the electrics. However, our smart chargers feature dynamic load balancing which smartly allocates available power between the units. So, for example we can set 6 units to charge at a maximum of 22kW. If only one EV charging station is being used, it will receive the full 22kW. If three are being used, this drops to 7.2kW each, and if all 6 are being used, each vehicle receives 3.6kW. Overall it means you can run 6 charging points off of a 22kW supply, instead of something larger and more expensive. This is because the required infrastructure (wiring, distribution boards, required import capacity) can be kept at more sensible sizes and minimise the cost of the installation. If your electric car parking bays aren’t going to be used at full capacity all the time (as cars come and go), this is an optimal approach to take. We have adopted this approach across our public car park EV chargepoint installations for Southampton City Council. It is possible to set up billing on each charge station, where users pay to charge their vehicles. Rates can be set by the owner, and the units are accessed by a standard RFID charge card. All chargepoint usage and billing data is controlled by a centralised web portal for easy access by finance departments. For businesses running fleets, or paying staff travel expenses it is possible to connect a smart charger at home to the billing system of the business so that fuel costs can be reimbursed automatically. Joju Solar offer a range of electric vehicle charge stations that are particularly well suited to businesses. NewMotion units come with a smart interface allowing you to see chargepoint usage and cost data on a portal for all chargers installed. They can be accessed by RFID (charge card) access for extra security and to control billing accounts. You can bill home charged electricity to your employer. New Motion chargers also feature dynamic load balancing to optimise the economics of their installation. ABB rapid chargers can charge at 150kW continuously – enough to fully charge even the largest cars in ½ hour. For vehicle applications where fast recharge items are needed, such as taxis and buses, the ABB rapid charger is an ideal solution. Charging powers up to 460kW are available. 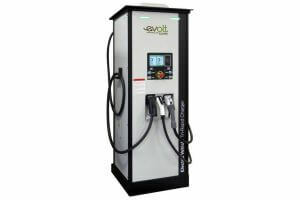 The APT Evolt rapid chargers are 50kW DC chargers. 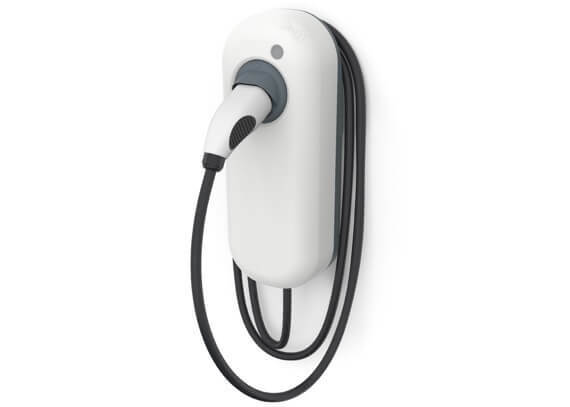 Communications (Ethernet & 3G) are integrated to allow permanent connection with remote charging stations, from which charging equipment data and pricing can be monitored in real time. Grants are available for installing electric car charging stations at work. Grants of £500 per chargepoint are available up to a maximum of 20 chargepoints. 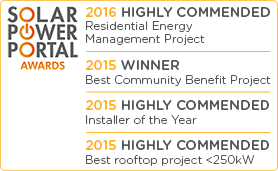 For more details see our Grants for Electric Vehicle Charging Page.